Many thanks Wendy for giving me a Kind Heart Award. Actually it's Wendy who deserves it for all the help she patiently gives in answer to my questions. I need to pass on this award to up to five other people. It's hard to choose from amongst the generous book artists who give so much of their time and knowledge so this is j ust a smattering of the people I appreciate. Judy, just for sharing and listening. Actually, these are all for sharing, especially those who freely give step by step instructions for books and materials and certainly give me a lot of inspiration to keep making books. 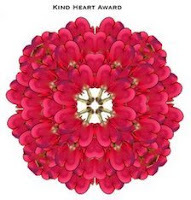 So Kind Heart Awards also to Tulibri, Rhonda, and Bookgirl. And I must mention Marloes, who makes the most beautiful books. See her flickr site here. I wish everyone could be in Sydney right now. This is the first week of autumn and the weather is just magic. Not too hot, a mild breeze and a deep blue that encompasses the entire sky. Down at the beach the waves are thunderous and only the intrepid are daring the surf today. After a cooler than usual summer (except for those days when the heat combined with humidity to take your breath away), it will be interesting to see what winter has in store. Gosh, now I'm talking about the weather. Time to go. Thank you for my award! Golly, I'd like to give it to you, because you have been so kind to me! I do love the graphic of the award. I present my awards tomorrow! I love those first crisp and clear autumn days too.....I know just what you mean when you describe the sky! We have had a very rainy day with two large bands of storms blowing through our area. It is now clearing and quite lovely, but it is going to get cold again! All of my daffodils are blooming, so, sadly, this may be the end for them. I heard on the weather this morning that we may actually get snow this weekend! I hope that won't hurt our peach crop! Thanks again, my kind-hearted friend! Carol, thank you so much for this award! I feel honoured. Sorry my comment is late; just came home from a holiday trip!